I love it when children decide to give to others for their birthdays! My niece did just that two years ago when she had a birthday party and asked her guests to bring gifts that she could give to her local SPCA. I had a request today from another young lady that wanted to spend her birthday with friends volunteering at her local Humane Society. 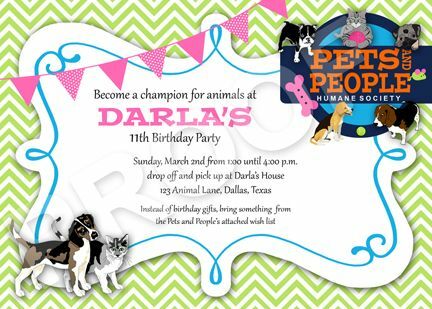 Here is the invitation that I created for her birthday party at Pets and People Humane Society. If you would like this invite or matching party printables or a custom invite for a special event contact Paper Perfection at jtanddolly@yahoo.com for pricing and details.